Have you ever seen Project Denneler's pinata cookies (BTW, does anyone know how to make a tilde-wavy line-over the "n")? So very clever! 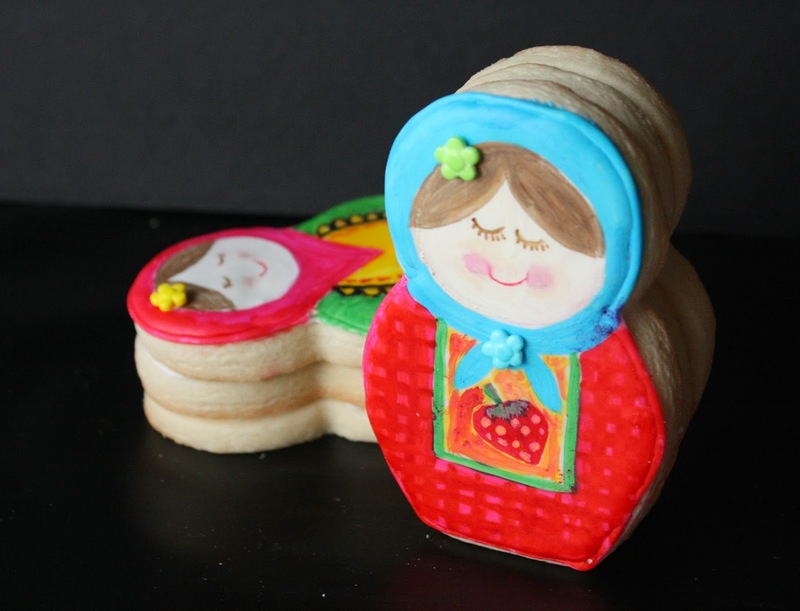 Well, when I decided to finally make some Babushka cookies, I wanted to bring the "nesting" feature into the cookie, and thought of the pinata cookies! These cookies are adapted from that idea. I used two sizes (4-inch and 2-inch) of the doll cutters from this 5-piece set. I cut the opening in the body of the middle cookie with a sharp knife before baking. Maybe I should have done it right from the oven after baking (as I noticed in the pinata cookie later), while the cookie was soft, to ensure an easier, better fit. It worked out fine though, because I used the same sharp knife for shaving a bit of the inner edges away from the opening after they cooled. Next time I will also roll out a thinner cookie for the "baby" cookie. (The truth is, I had the smaller cookies already baked before my idea was fully formulated, but didn't want to make more (thinner) cookies right then. Each cookie was iced with white royal icing (and completely dry) before I "painted" it with food coloring gels. 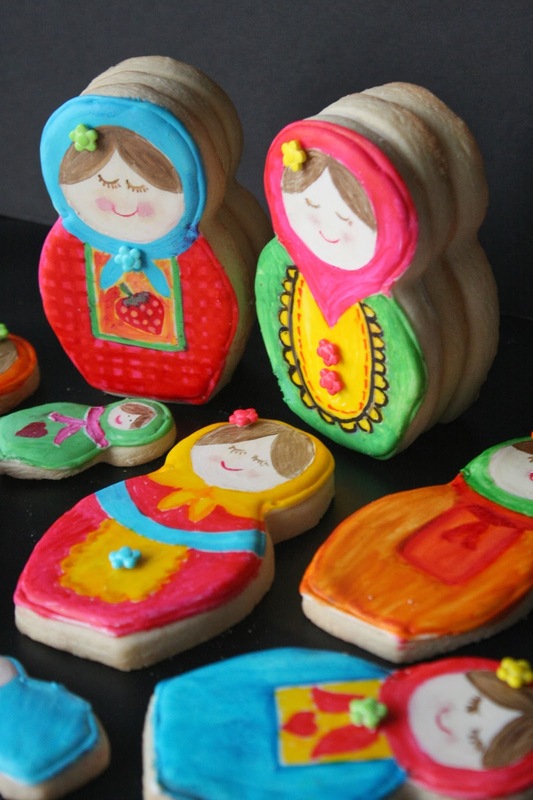 Initially, I was going to decorate with royal icing, but decided to paint, which is more like the original, wooden Babushka dolls. The round faces on the larger cookies were made by first tracing with an edible marker around a round cutter. For the smaller cookies, I used the wide part of a decorating tip to make the circle for the faces.. A combination of ivory (mostly) and brown was used to paint the base color for the faces. After the base layer dried, I painted the cookies, trying to make each unique. It was so much fun! I guarantee I will be making these cookies again! The colors are so cheerful and vibrant. After the colors dried, I used royal icing around the edges to adhere the three cookies together, with the small cookie first set into the middle one. These would be so cute for a baby shower, or even a gender reveal celebration, with the baby inside wrapped in either a blue or pink bunting. To dress up the gals, use some flower sprinkles (or hearts) to embellish and some pink disco dust for the cheeks (applied with a cotton swab). It is not too difficult to take off the top cookie when the time comes. Merely grasp it firmly and "slide" the top cookie to the side. 2. Using a small, sharp knife, cut an opening in one of the large cookies from each set (either before or after baking). If before baking, cut the opening on the cookie sheet and place the baking sheet in freezer before baking. If after baking, cut the opening while the cookie is still warm/soft. In both cases use the small cutter as a guide for determining the size of the opening. 3. Outline and fill in the the large cookies (just the top cookies) with untinted royal icing. Let dry. 4. 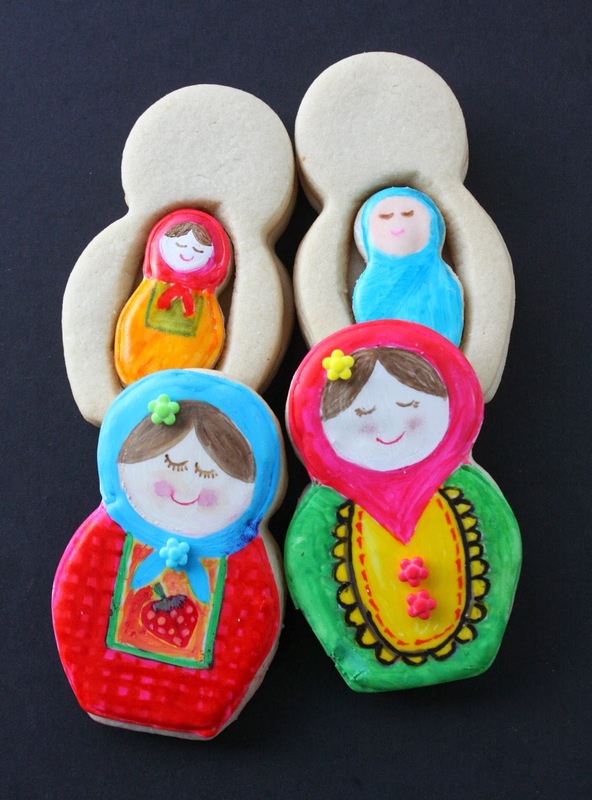 Using the round cutters and an edible marker, trace a "face" on the top cookies, and the smaller cookies using the wide opening of a decorating tip. 5. Mix colors according to your liking for the base color of the faces. Let dry. 6. Paint the facial details and hair. with the small brushes and the gel food coloring. Use water to clean brushes between colors and paper towels to dry the brushes, if need be. 7. 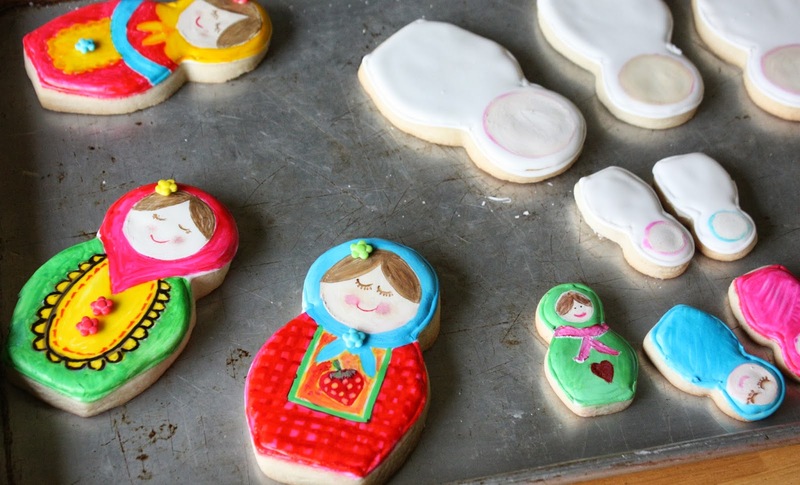 Paint the rest of each cookie (top cookie only), including the smaller ones, and let dry. 8. Embellish each cookie as desired, using royal icing to add sprinkles. 9. 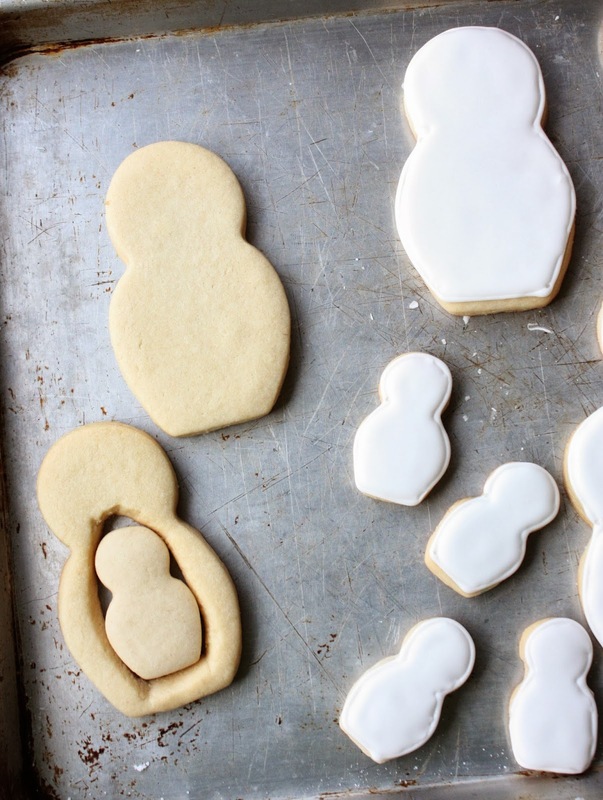 Put cookies together: Place a large cookie on bottom, outlining along the edges with royal icing. 10. Add the large cookie with the opening on top of that one, setting the small cookie inside. Outline the edge of that cookie with royal icing. 11. Place the final, decorated cookie on top of the middle cookie. Let dry completely. 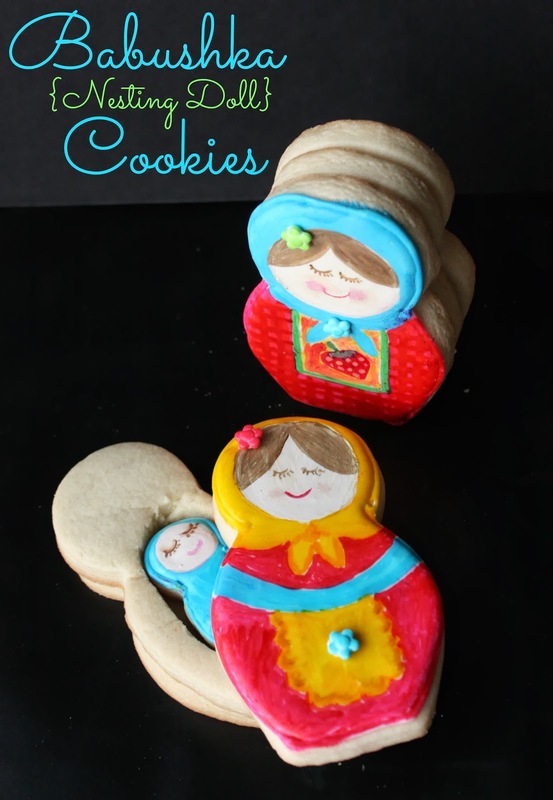 These babushka cookies are so gorgeous!!!! I love them, Sue. Thanks so much, Vero. Enjoy your week! That's so cute and original! I love how you painted the cookies. So cute SUe. I love that you always come up with such original ideas. These are so cool!!! So creative, I love what you did! Thanks for sharing! You are talented. Sue! We are cookie sisters today. These are amazing! Great minds think alike, cookie sister! <3 Thanks for your comment! Such a great idea. I have many of these dolls in my home, they were gifts from my Russian exchange student. I love your cookie version and know she would too. Oh my GOSH! I LOVE, LOVE, LOVE these! Where were these during the Olympics?! What a fun and cute idea! Haha, always a day late here, Courtney:) Thanks for your comment! Sue, I can't believe the sheer amount of work you put into these. They are gorgeous, so fun, and absolutely perfect. I LOVE them. I can't get enough. Pinned! Absolute perfection. What stunning babushka! I really love these beautiful cookies. You have outdone yourself! 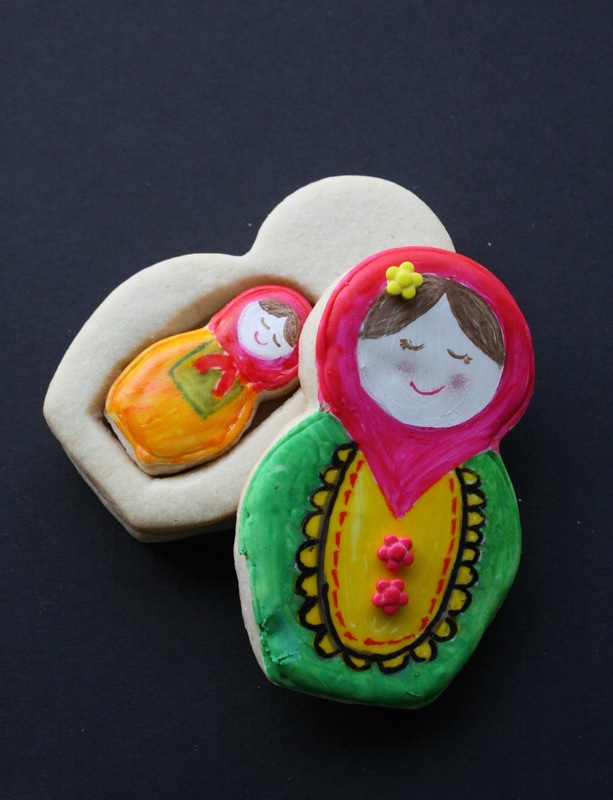 Not just a beautifully decorated cookie, but nested too! What a wonderful idea - and a wonderful surprise! LOVE! Sue, your cookies are, once again, AMAZING!!! These are so darn cute! I love that they are "nesting" with the little one inside. These cookies made me smile! But I guess that to create them one need to be not only professional in cooking but to possess skills in painting but unfortunately I am not sure I would be able to make the same. This is such a creative idea! The cookies look fabulous! These are AWESOME! I love that you can slide off the top cookie to find the nested doll. I pinned them. Love 'em! Glad you like them , Aida:) Thanks for you comment, and the pin! These are ADORABLE!!! I would love for you to link them up and party with us at A Peek Into My Paradise! My jaw is on the floor! These are brilliant!!!! !